.NET Core 5, Entity Framework 7, ASP.NET 5 (vNext) & MVC 6 are all Dead! Scott Hanselman from the ASP.NET team explains in his blog post the motivation behind the name change but in summary the new naming is more aligned with the brand new .NET Core concept as a whole. Just to note, this is not only a simple change of name, it is going to affect all of the .NET packages available on NuGet, APIs and even the namespaces making it very clear which flavour of .NET you wish to use. For those of you who are not familiar with .NET Core, it is Microsoft's official (unlike Mono) cross -platform implementation of the CLI running on Windows, OSX and LINUX. 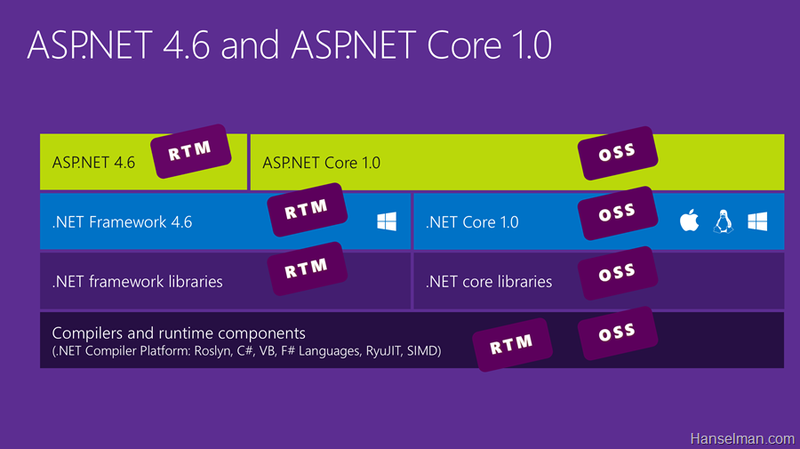 And here is the good part......it's all open source together with the rest of .NET. Don't believe me?! take a look for yourself. The Command Line Interface giving a new cross-platform command line experience on Windows, OSX and Linux which you can use to build .NET Core applications but it is also capable of building class libraries and Console applications which can run on the full .NET framework. ASP.NET Core is the brand new framework built from the ground up on top of .NET Core which can also run on the full .NET framework, here's another nice diagram by Scott to make it more clear in the larger .NET universe.